You are the best judge if your child is ready to participate in packing their own Go Bag. Ask them which item is an absolute “must have” in their emergency kit, after you discuss what the kit is for and why you are preparing now for a possible wildfire. Your kids should have the family communications plan and all important phone numbers with them at all times. Being prepared ahead of time is the best way to minimize risk and trauma. Kids living in this area have seen smoke from wildfires and ash falling from the sky. Give them age-appropriate, factual information and let them know why it is important to prepare. Let them participate in getting your home and yard ready for fire season. Explain why on smoke-filled days outdoor activities are restricted, including the health risks. Practicing how to safely evacuate with your kids is an important emergency preparedness exercise. If your kid is driving, talk to them about safe driving during heavy smoke – headlights on, reduce speed and watch for emergency personnel and possible road closures. Their car, just like yours, should contain a Go Bag and during high fire season it is important to keep the gas tank full. Remind them! Talk to anyone who regularly has contact with your kids: babysitters, caregivers, the parents of your kids’ friends and if you feel it is appropriate, share your emergency contact information with them. You can find tips on the Help Kids Cope app, developed by UCLA. “Help Kids Cope is an app designed to assist parents in talking to their children about different disasters they may experience or have already experienced. 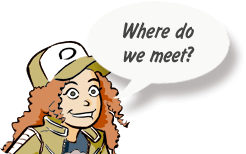 This app includes 10 different disaster types with sections in each on how to explain, prepare, respond, and heal from the event their family is concerned with. Each section gives guidance on talking to preschool, school-age, and adolescent children, as well as, includes ways parents can help themselves cope and support their children’s reactions.” Download the free app either in the iTunes or Android store. Nevada County Superintendent of Schools Office (NCSOS) is one of few in the state that has a School Safety and Climate Coordinator. This staff person ensures schools are provided with the latest information on school safety and helps to conduct drills on school sites, acts as the liaison between schools and first responders, and serves as a resource for all schools. Each school has a comprehensive safety plan that is updated each year. Included is a section on fires that describe staff training, student drills and evacuation/reunification plans as well as roles in an emergency. The NCSOS and school personnel train with our local fire departments and law enforcement agencies to safely evacuate your kids. Your kids and school staff receive monthly training on fire evacuation. Let your kids know how important it is for them to follow directions given by their teachers, school staff or first responders in case of an emergency – for their own safety. In rare instances, where more distance is needed to ensure student safety, students may be relocated to another site for reunification with parent/guardians. This includes during a threat of wildfire or other threat to the safety of staff and students. Parents will be advised of reunification sites through phone call/text/email/social media. 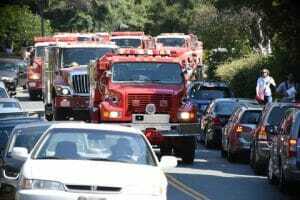 Avoid clogging access to schools, let first responders do their job. Have persons authorized to pick up students LISTED ON STUDENT EMERGENCY CARD. No student will be released to any other adult, if not listed on the current emergency card. Be sure your student’s emergency card is up to date with emergency contact names and numbers. 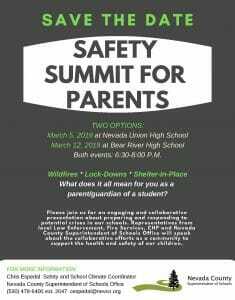 The Nevada County Superintendent of Schools Office is inviting all parents to attend a Safety Summit for Parents, either on March 5th at Nevada Union High School or March 12th at Bear River High School. Both events start at 6:30 pm. 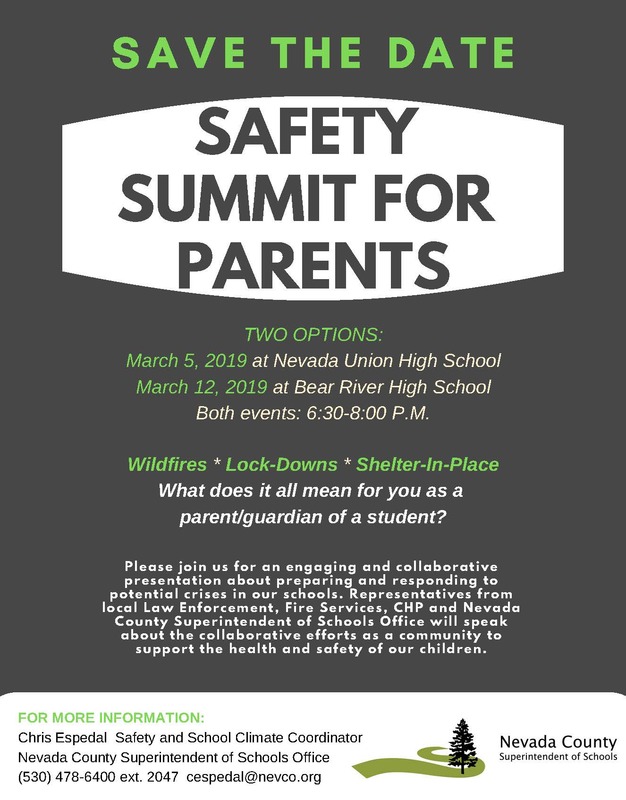 Representatives from local law enforcement, fire departments, CHP and Nevada County Superintendent of Schools Office will speak about the collaborative efforts as a community to support the health and safety of your children. If your kids spend time at a summer camp or on vacation without you, talk to the organizers and find out what their emergency plans are. Know their evacuation procedures and how you will be informed in case of an emergency. This concludes Week 10 of 25, next Monday we’ll focus on pet evacuations – staying calm is half the battle.